The Collision Analyzer watches for collisions and graphs output in the Collision Analysis window. The higher the output on the graph, the more performers are colliding during those counts. Selecting the option to Show Warning Sign on Performers at Risk in the Collision Analyzer window will display a visual warning symbol on the performer(s) at risk on counts where collisions might occur. This will be displayed on your design grid. Collisions are based on performer size. 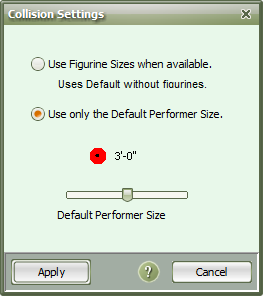 This is determined by Figurines or setting the Default Performer Size in the Collision Analyzer Settings. The Performer Size is the perimeter around a performer. When setting the Performer Size, you should consider instrumentation and equipment. Performer Size is automatically calculated. To have a more specific threshold for collisions, select the option to use Figurine Size. To have the same Performer Size for everyone in the ensemble, use the Default Performer Size option and set the value to what works best for your ensemble.